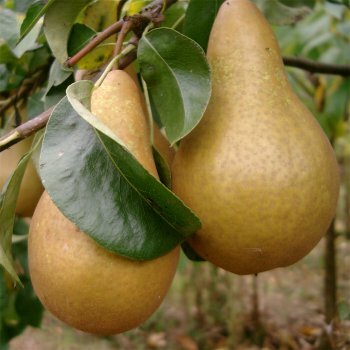 Pear Beurre Hardy produces a good crop of large pears in mid September that are ready to eat from October onwards. The light green, brown russet fruits have very juicy, tender flesh with a delicious rosewater flavour. Spring flowers are white. Originating from France, Beurre Hardy has become a popular Pear tree variety in the UK and has received the RHS Award of Garden Merit. Beurre Hardy pear trees require a pollination partner in group A, B or C.
Beurre Hardy requires a suitable pollination partner. Pear trees should be spaced according to their rootstock, for example a Quince A (semi-vigorous) rootstock will require approx. 3 metres between trees, whereas a Quince C (dwarf) rootstock will require approx. 2 metres between trees.